This began to change with the arrival of solid-state components that made the digitization of audio practical, which was further solidified by the Audio Engineering Society’s (AES) release of the AES3 digital audio standard. Along with defining signal protocols, AES3 also specified transmission technologies, which recognized in addition to telco’s balanced twisted-pair methodology coaxial cable and fiber. While switching the output from one device to the input of another within a broadcast facility was still done with classic crosspoint switching, broadcasters began reworking their router’s crosspoints and I/O to pass higher frequencies associated with the flow of digital audio signals. While the broadcast and professional audio sectors were busy moving from analog to digital technology for both audio and video transmission, the computer and data processing industries were pursuing their own share of changes involving technology development and refinement. This included the emergence of the ubiquitous PC, along with the creation of faster processors, denser data storage technologies and increasingly more resilient and higher speed networking configurations. These rapidly developing technologies on both sides of the aisle have converged to create a perfect storm of sorts, with the broadcast sector now being able to leverage the great deal of Internet Protocol (IP) research and development done by the computer and data processing world. This convergence provided the ability to now move audio signals around a broadcast or content production facility as data packets flowing over computer networks instead of the classic transport through dedicated shielded twisted-pair cables. Once the broadcast industry started going digital, some forward-thinking individuals realized it would be easy to break away from traditional crosspoint routing and direct their AES3 audio packets around the facility using the IP technology adopted by the computer industry for delivering signals. Due to economy of scale, hardware devices (network switches) for routing data packets are much more affordable, and in general, occupy less rack space and consume less power than conventional broadcast A/V crosspoint routers. Another very tangible benefit in moving to an IP platform is its inherent scalability, making it virtually impossible to outgrow. As a broadcaster adds additional playout channels, studio configurations, editing facilities and the like, it’s relatively easy to resize the networking arrangement to accommodate this additional equipment. This is particularly true when compared to the complexity, expense and workarounds required when replacing a conventional crosspoint router that has been maxed out. An IP platform brings other benefits, especially with interconnecting cables. The challenges of deploying and terminating traditional cabling options for IP wiring, such as shielded twisted-pair audio line and coax cables, have been largely resolved with modern cable alternatives, particularly lightweight, unshielded twisted-pair (UTP) Category (CAT) cabling and high-performance, higher bandwidth fiber optic (fiber) cabling. The deployment of IP connectivity with CAT and fiber cabling can make a huge difference in the construction and operation of an outside broadcast (OB) vehicle. Depending on the size and complexity of the production truck, hundreds or thousands of pounds can be shed by eliminating conventional A/V cables and their associated connectors. Such reduction in weight translates to lower fuel and maintenance costs over the life of the vehicle. IP technology also enables additional economies in weight and space, as it allows the transport of multiple signal types via a single cable, instead of the multiple dedicated lines needed in conventional facility architecture. Audio, video, intercom, tally and equipment control signals can all flow within a single CAT pair, as they exist as streams of packets with instructions as to where they are to be sent. Fiber cabling also provides a durable, reliable means of establishing IP connectivity. Robust fiber cabling, such as armored fiber, can guarantee a faster, higher-performance means of signal flow delivery compared to traditional cabling, while also leaving bandwidth for additional needs. This ability to handle a variety of signals over a single circuit has the potential for greatly simplifying and reducing costs associated with outside broadcasts. With IP connectivity in place to a remote venue and IP-enabled equipment, it would only be necessary to transport cameras and microphones to the broadcast site. All mixing, switching, camera shading and other operations now performed in OB truck would be handled at the studio location. Another big plus for IP technology is its agnosticism when it comes to equipment. This makes conversion to the technology easier than might otherwise be imagined. Just as many broadcasters and content creators did when converting from analog to digital-based operations, broadcasters can establish IP islands in a facility linked from existing control panels via suitable interfacing. In this way, such a change would be invisible to operators, as such physical control units and surfaces would operate exactly as they always had, but now controlling a hybrid mix of IP-based and conventional equipment. Is the Broadcast Community Ready for IP, and is IP Ready for Them? Despite the advantages of deploying IP technology within broadcast and content creation operations, skepticism remains about making such a move. Fear of the unknown is common when moving away from anything familiar and comfortable. Perhaps one of the biggest question marks in this regard has been the handling of AES3 audio, as the original standard simply recognized how data packets were to be assembled and the methodologies for transporting them. 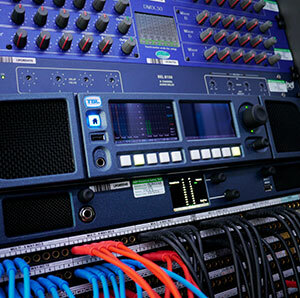 As digital audio became more ingrained in radio and television workplaces, several equipment manufacturers and groups developed their own network transport technologies, which weren’t necessarily compatible with one another. To establish harmony, the AES took the matter under study and published AES67 in 2013, an open standard for interoperability in networking of audio over data networks. Its goal was to allow previously competing networking technologies to interface, including Ravenna, Dante and others. While AES67 was a giant leap forward, there are still other issues that cause concern among adopters of IP transport. These lie chiefly in a mechanism for controlling audio flow, without which a fully plug-and-play situation is not possible. Being able to reliably send audio from one device to another through an intermediate piece of equipment can be a big sticking point. Fortunately, products are now on the market to supply this missing puzzle piece, providing discovery, monitoring and control of audio flowing across networks. A great deal of concern has been raised about the troubleshooting and isolation of a failed or failing piece of equipment in an IP-based facility. Granted, location of faults in a conventional facility is easily accomplished by connecting a suitable monitor at various points in an AES3 or SDI signal flow to aurally or visually ascertain the location of a problem. Patching around failed gear is equally easy. While this sort of troubleshooting and fault isolation doesn’t exist in an IP facility, monitoring equipment is readily available for facilitating diagnosis and resolution of IP signal flow problems, even in a very large facility. This extends to continuous monitoring of IP system health, with automatic and transparent switching to an alternate routing or backup device when anomalies are detected. Such technology can provide instantaneous alerting of operational and maintenance personnel via text messages or email. The nature of IP provides opportunities for troubleshooting and remediation unimaginable just a few years ago. Internet connectivity further bolsters such capabilities by allowing both the inspection of system parameters and corrective actions to be accomplished from virtually anywhere in the world. If there are any doubts about industry acceptance of IP technology, one need only look back to this past September and the adoption of the first elements within the SMPTE ST 2110 “Professional Media Over Managed IP Networks” standards suite. This document firmly establishes IP’s future and will allow broadcast technology suppliers who may have been reluctant to move forward in producing interoperable gear for their customers. It’s not too early to start thinking about what conversion to IP connectivity could do to benefit your broadcasting or content production operations.